Reparto: Logan Lerman (Percy Jackson), Alexandra Daddario (Annabeth), Sean Bean (Zeus), Jake Abel (Luke), Stanley Tucci (Dionysus), Nathan Fillion (Hermes), Anthony Head (Chiron), Leven Rambin (Clarisse), Daniel Cudmore (Manticore), Douglas Smith (Tyson), Grey Damon (Chris Rodriguez), Robert Maillet (Polyphemus). 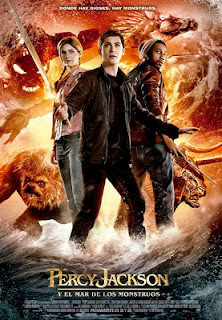 Guión: Larry Karaszewski, Marc Guggenheim y Scott Alexander, basado en la novela de Rick Riordan. Producción: Chris Columbus y Karen Rosenfelt. Productoras: Fox 2000 Pictures, Second Line Stages, TCF Vancouver Productions y Trireme Productions.